Firefighters responded to a call at 12:12 a.m. from a neighbor who reported hearing an explosion, according to the Marblehead Fire Department. At the scene, six boats and multiple trailers were ablaze in the area of 16 Lincoln Avenue, according to the Department of Fire Services. 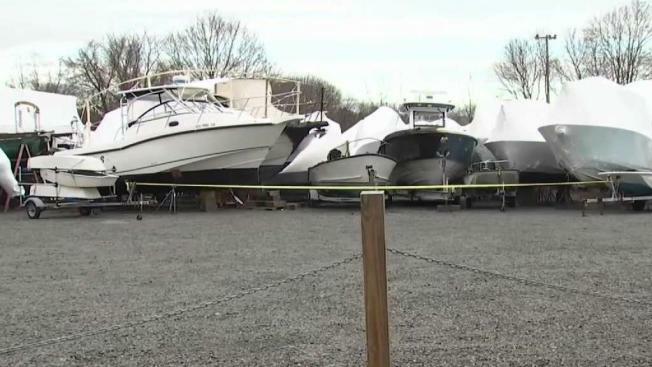 Fire crews in Marblehead, Massachusetts are investigating an overnight fire that burned several boats. Firefighters responded to a call at 12:12 a.m. from a neighbor who reported hearing an explosion, according to the Marblehead Fire Department. The fire department received several similar calls at around that time. At the scene, six boats and multiple trailers were ablaze in the area of 16 Lincoln Avenue, according to the Department of Fire Services. The area is a boat storage lot operated by Ryan Marine. Crews were able to douse the flames before 12:40 a.m., fire officials said. The cause of the fire is undetermined at this time, according to fire officials, but the focus is on an accidental cause which spread to the other boats. The fire is renewing concern among neighbors who have long questioned the safety and legality of the boatyard. It is in a residential area and they worry about so many boats being stored so close to their homes. Hours after the fire, Marblehead’s new town administrator had a meeting with the homeowners. He wants to have a meeting with all parties involved in the near future and those who attended left feeling hopeful. “It’s unfortunate that it takes this type of an event to get some attention, but I’m hopeful, fingers crossed, that something will happen now,” West said. The homeowners also have another meeting with the Marblehead fire chief on Monday. The owner of Ryan Marine would not comment on the concerns but said he would attend a meeting if invited. He said he is relieved the fire was not worse and that everyone is safe.